The eighth annual Delta Draf is on Saturday 8 April 2017, so put on your takkies or state-of-the-art running shoes and head out to the farm for a trail run that must rate as one of the most beautiful on the running calendar. It is a fun, healthy weekend activity for the whole family. 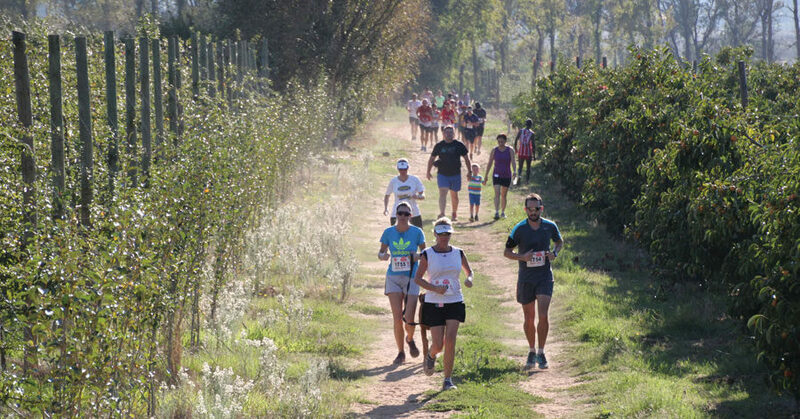 Organised by the Dwars River Valley Athletics Club, this 10km off-road race and 5km fun run follows a route through working vineyards and along the banks of the Dwars river, set against the backdrop of the majestic Groot and Klein Drakenstein mountains. Medals for all finishers as well as Spot Prizes! This race is in accordance with the rules of ASA & BA. Organised by Dwars River Athletics Club. Participants must obey instructions of marshals/traffic officers. Runners must compete in official club colours and display unaltered license numbers, valid for 2017, on the front and back of the running vest. In addition to overall open prizes, participants will only be eligible for an age category prize in the age category they enter. Corresponding numerical age category tags must be worn on the front and back of the vest. Participants may enter the age category corresponding to their chronological age or any younger category down to open. Temporary license participants are eligible for age category prizes, provided they enter the relevant age group and wear the appropriate age tags. Race entry cards must be worn for the duration of the race. When you receive a position card after you have completed the race, place entry card in it and place it on position board. No seconding from a moving vehicle will be allowed. Tog bag area provided at runners’ own risk. Race results will be sent to all clubs.